Good afternoon! Today I have a more fun post for you, haha. Yes, you are looking at a really close dupe for Deborah Lippmann's Across The Universe! I first saw this polish on The PolishAholic, she compared them both and I was totally sold. I pretty much ran to Icing. These sell for $8.50 in Canada or $7.50 in the states, and cosmetics are basically always buy one get one 50% off. They are only available at Icing stores. Force of Love is a deep blue sheer base with big hexagonal blue and green glitter, with smaller blue and silver glitter mixed in. Top-bottom: China Glaze First Mate, no-name blue lollipop polish, and Finger Paints Carnation Creation. I liked First Mate the best, so I put it on my nails! Loooooove it. 3 fingers are 2 coats of First Mate with one coat of Force of Love. The pinky is 4 coats of Force of Love alone. My pinky is on the right. Doing more coats gives it more depth, but these bottles are pretty small so I would rather layer it. It's just so pretty. I'm so happy I discovered it. And now for the next color, Magnetic Attraction. This reminds me a little of Lippmann's Today Was A Fairytale, but it is not really that close. This one is a clear base with large hexagonal glitter that is a bit holo, and smaller black and iridescent glitter. I wasn't sure what I wanted to swatch this one over, but then I got nail mail from Traci! And I decided to wear it over the polish she sent me. I guess I'll have to compare them whenever I swatch JITNB. They aren't too close. And then I added Magnetic Attraction. The glitter disperses pretty well. Almost all the iridescent glitter looks dark blue over the deep green base. I really like this combo and I kept it on instead of just swatching it! Verdict: If there is an Icing store near you, go there. Go there now. In other news, my kiosk is right next to a Mrs Fields cookies store, and they are baking cookies right now, and the smell is KILLING ME. But cannot have cookies as I only have 16 days left for my Katy Perry diet! Hahaha. Those are awesome! I don't have an icing close... and I still think I'm going to splurge on the DL Across the Universe. It is my one true love! You definitely made me want to stop by Icing very soon! I really like the blue one. Yay glitter! I don't have an Icing store near me which is so sad really. I love the Across The Universe and had to settle for a Kleancolor glitter called Blue Eyed Girl to layer over black or blue to get a close dupe, curse you Deborah Lippmann for your awesome but expensive glitters! Oh my! it looks beautiful, I need to start experimenting more with layering. This is gorgeous on the green . I am loving the Essie Going Incognito combo!!! So pretty! Icing has quickly become one of my favourite places to shop for polishes. If people are going there looking for this combo I suggest picking up "Epic Winning" as well. 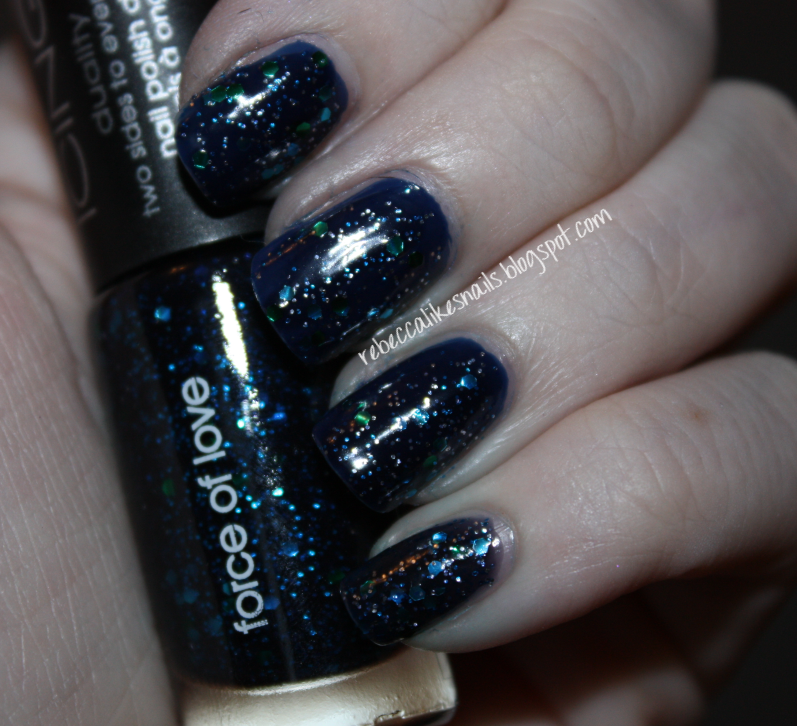 It is half dark blue glitter and half silver holo glitter! Ooh good choice with First Mate! Looks great. Lol what is this Katy Perry diet? heartNAT, I'm dieting before I go to montreal to see Katy, lol.